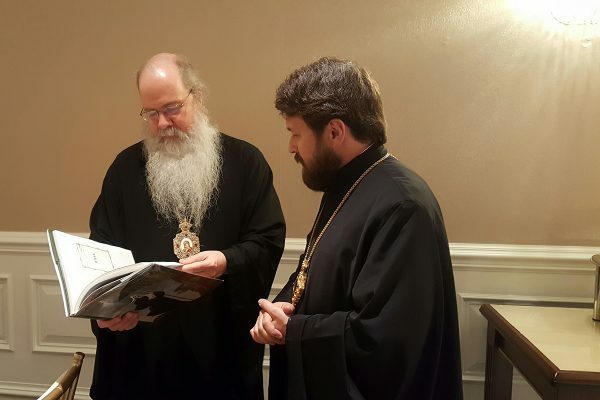 On 13 May 2017, Metropolitan Hilarion of Volokolamsk, chairman of the Moscow Patriarchate’s Department for External Church Relations DECR), head of the Russian Orthodox Church delegation to the World Summit in Defense of Persecuted Christians, met with His Beatitude Metropolitan Tikhon of All America and Canada. Also taking part in the meeting, which took place in Washington, were Bishop John of Naro-Fominsk, administrator of the Patriarchal parishes in the USA; Archpriest Jaroslav Lutoshkin; Mr. Philip Champion, a staff member of the DECR Secretariat for Inter-Christian Relation s; Bishop Daniel of Santa Rosa; Archpriest Johh A. Jilions, Chancellor of the Orthodox Church in America; Archpriest Eric G. Tosi, Secretary of the Orthodox Church in America; and Archdeacon Joseph Matusiak. The ongoing mass persecution of Christians in the Middle East and in certain countries of Africa and Asia was discussed with a focus on the necessity to consolidate efforts of the world community in the struggle against extremism and terrorism. Metropolitan Hilarion noted that war will continue as long as several anti-terrorist coalitions exist which do not coordinate their action. The extremists will be conquered only when the USA and Russia will work out common strategy, set aside their political differencies and jointly fight terrorism in the Middle East. His Beatitude Metropolitan Tikhon spoke of the importance of covering the tragedy of persecuted Christians in the mass media which almost completely ignore this problem and many people do not know about the persecution of those who believe in Christ in the Middle East, Africa and other regions of the world. Also discussed was a wide range of issues pertaining to bilateral relations between the Russian Orthodox Church and the Orthodox Church in America, for instance, cooperation in the academic sphere.